Commodity Prices: Financialization or Supply and Demand? I've often panned the idea that commodity prices have been greatly influenced by so-called financialization---the emergence of tradable commodity price indices and growing participation by Wall Street in commodity futures trading. No, Goldman Sachs did not cause the food and oil-price spikes in recent years. I've had good company in this view. See, for example, Killian, Knittel and Pindyck, Krugman (also here), Hamilton, Irwin and coauthers, and I expect many others. I don't deny that Wall Street has gotten deeper into the commodity game, a trend that many connect to Gorton and Rouwenhorst (and much earlier similar findings). But my sense is that commodity prices derive from more-or-less fundamental factors--supply and demand--and fairly reasonable expectations about future supply and demand. Bubbles can happen in commodities, but mainly when there is poor information about supply, demand, trade and inventories. Consider rice, circa 2008. But most aren't thinking about rice. They're thinking about oil. The financialization/speculation meme hasn't gone away, and now bigger guns are entering the fray, with some new theorizing and evidence. Xiong theorizes (also see Cheng and Xiong and Tang and Xiong) that commodity demand might be upward sloping. A tacit implication is that new speculation of higher prices could feed higher demand, leading to even higher prices, and an upward spiral. A commodity price "bubble" could arise without accumulation of inventories, as many of us have argued. Tang and Xiong don't actually write this, but I think some readers may infer it (incorrectly, in my view). It is an interesting and counter-intuitive result. After all, The Law of Demand is the first thing everybody learns in Econ 101: holding all else the same, people buy less as price goes up. Tang and Xiong get around this by considering how market participants learn about future supply and demand. Here it's important to realize that commodity consumers are actually businesses that use commodities as inputs into their production processes. Think of refineries, food processors, or, further down the chain, shipping companies and airlines. These businesses are trying to read crystal balls about future demand for their final products. Tang and Xiong suppose that commodity futures tell these businesses something about future demand. Higher commodity futures may indicate stronger future demand for their finished, so they buy more raw commodities, not less. There's probably some truth to this view. 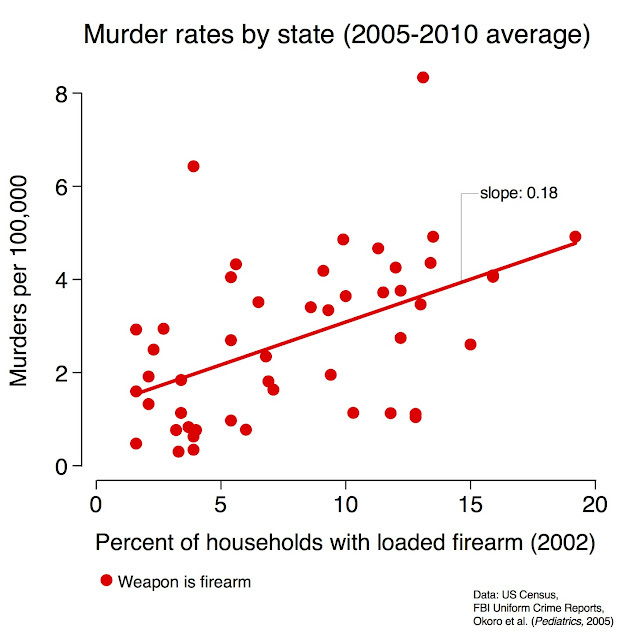 However, it's not clear whether or when demand curves would actually bend backwards. And more pointedly, even if the theory were true, it doesn't really imply any kind of market failure that regulation might ameliorate. Presumably some traders actually have a sense of the factors causing prices to spike: rapidly growing demand in China and other parts of Asia, a bad drought, an oil prospect that doesn't pan out, conflict in the Middle East that might disrupt future oil exports, and so on. Demand shifting out due to reasonable expectations of higher future demand for finished product is not a market failure or the makings of a bubble. I think Tang and Xiong know this, but the context of their reasoning seems to suggest they've uncovered a real anomaly, and I don't think they have. Yes, it would be good to have more and better information about product supply, demand and disposition. But we already knew that. What about the new evidence? 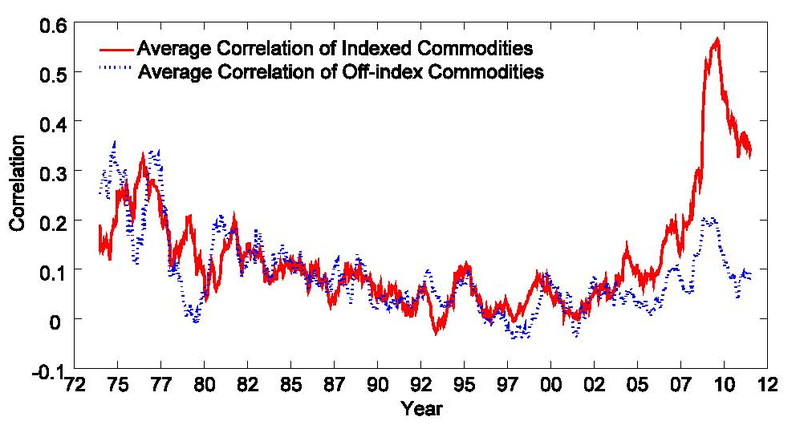 One piece of evidence is that commodity prices have become more correlated with each other, and with stock prices, with a big spike around 2008, and much more so for indexed commodities than off-index commodities. This spike in correlatedness happens to coincide with the overall spike in commodity prices, especially oil and food commodities. This fact would seem consistent with the idea that aggregate demand growth--real or anticipated--was driving both higher prices and higher correlatedness. This view isn't contrary to Tang and Xiong's theory, or really contrary to any of the other experts I linked to above. And none of this really suggests speculation or financialization has anything to do with it. After all, Wall Street interest in commodities started growing much earlier, between 2004 and 2007, and we don't see much out of the ordinary around that time. The observation that common demand factors---mainly China growth pre-2008 and the Great Recession since then---have been driving price fluctuations also helps to explain changing hedging profiles and risk premiums noted by Tang and Xiong and others. When idiosyncratic supply shocks drive commodity price fluctuations (e.g, bad weather), we should expect little correlation with the aggregate economy, and risk premiums should be low, and possibly even negative for critical inputs like oil. But when large demand shocks drive fluctuations, correlatedness becomes positive and so do risk premiums. None of this is really contrary to what Tang and Xiong write. But I'm kind of confused about why they see demand growth from China as an alternative explanation for their findings. It all looks the same to me. It all looks like good old fashioned fundamentals. Another critical point about correlatedness that Tang and Xiong overlook is the role of ethanol policy. Ethanol started to become serious business around 2007 and going into 2008, making a real if modest contribution to our fuel supply, and drawing a huge share of the all-important US corn crop. During this period, even without subsidies, ethanol was competitive with gasoline. Moreover, ethanol concentrations hadn't yet hit 10% blend wall, above which ethanol might damage some standard gasoline engines. So, for a short while, oil and corn were effectively perfect substitutes, and this caused their prices to be highly correlated. Corn prices, in turn, tend to be highly correlated with soybean and wheat prices, since they are substitutes in both production and consumption. 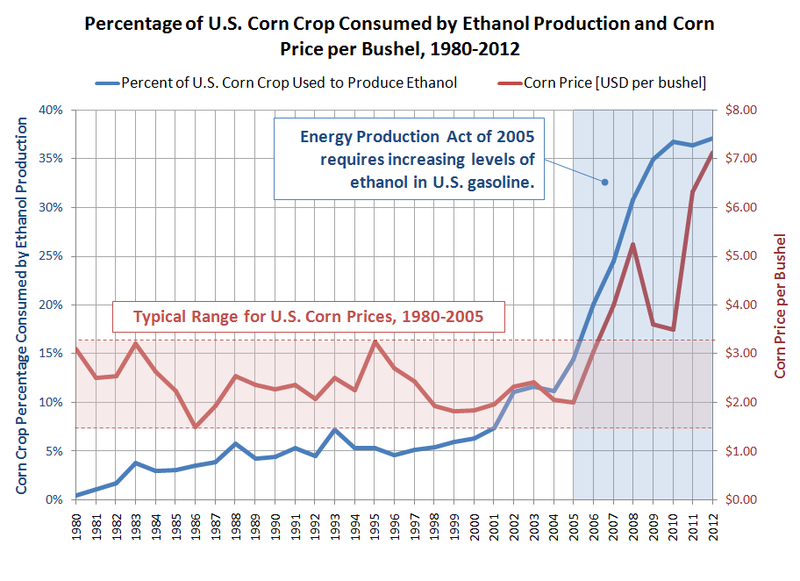 With ethanol effectively bridging energy and agricultural commodities, we got a big spike in correlatedness. And it had nothing to do with financialization or speculation. Note that this link effectively broke shortly thereafter. Once ethanol concentrations hit the blend wall, oil and ethanol went from being nearly perfect substitutes to nearly perfect complements in the production of gasoline. They still shared some aggregate demand shocks, but oil-specific supply shocks and some speculative shocks started to push corn and oil prices in opposite directions. Tang and Xiong also present new evidence on the volatility of hedgers positions. Hedgers--presumably commodity sellers who are more invested in commodities and want to their risk onto Wall Street---have highly volatile positions relative to the volatility of actual output. These are interesting statistics. But it really seems like a comparison of apples and oranges. Why should we expect hedger's positions to scale with the volatility of output? There are two risks for farmers: quantity and price. For most farmers one is a poor substitute for the other. After all, very small changes in quantity can cause huge changes in price due to the steep and possibly even backward-bending demand. And it's not just US output that matters. US farmers pay close attention to weather and harvest in Brazil, Australia, Russia, China and other places, too. It also depends a little on which farmers we're talking about, since some farmers have a natural hedge if they are in a region with a high concentration of production (Iowa), while others don't (Georgia). And farmers also have an ongoing interest in the value of their land that far exceeds the current crop, which they can partially hedge through commodity markets since prices tend to be highly autocorrelated. Also, today's farmers, especially those engaged in futures markets, may be highly diversified into other non-agricultural investments. It's not really clear what their best hedging strategy ought to look like. Anyhow, these are nice papers with a bit of good data to ponder, and a very nice review of past literature. But I don't see how any of it sheds new light on the effects of commodity financialization. All of it is easy to reconcile with existing frameworks. I still see no evidence that speculation and Wall Street involvement in commodities is wreaking havoc. 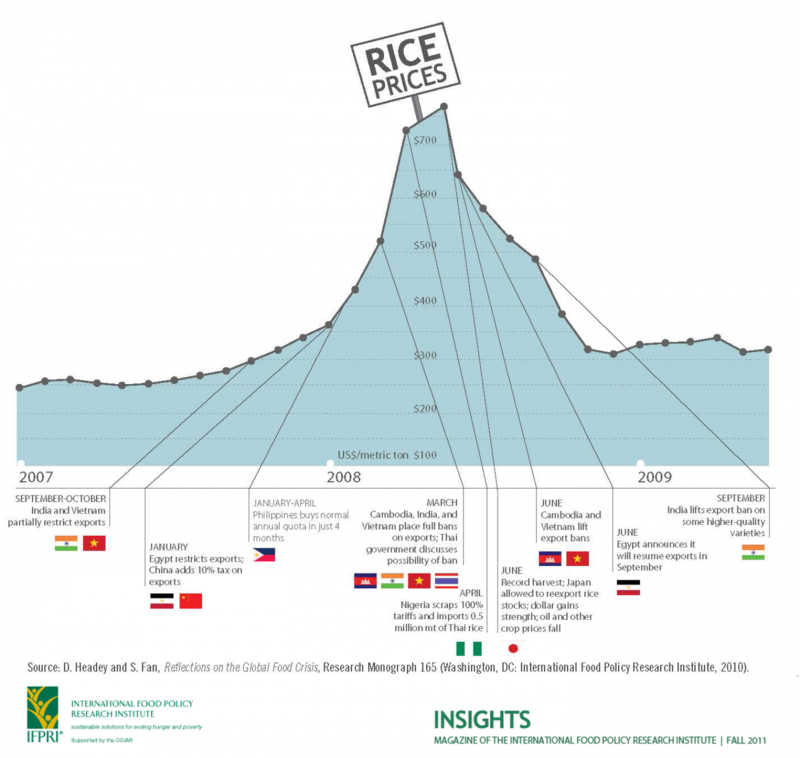 What’s the goal and point of national biofuel regulation? While preparing a lecture for the 4th Berkeley Summer School in Environmental and Energy Economics, I returned to contemplating the regulation of biofuels as part of a federal strategy to combat climate change and increase energy security. If we review policy approaches for increasing the share of biofuels in the transportation fuels supply across this great land, there are three main approaches. We have subsidies for the production of ethanol and biodiesel, renewable fuels standards (RFS) and low carbon fuels standards (LCFS). The two main tools employed at the federal level are subsidies, which essentially provide a per gallon payment for producing a gallon of a certain type of biofuel, and renewable fuels standards, which require the production of different classes and quantities of biofuels over a prescribed time path. California has employed a low carbon fuel standard, whose goal it is to decrease the average carbon content of California’s gasoline by prescribed percentages over time. It relies on life cycle calculations for the carbon content of different fuels and allows producers to choose a mix of different fuels, which decrease the average carbon content, thus providing more flexibility in terms of fuels compared to the RFS. If I were elected the social planner, I would recognize that I am most likely not smarter than the market, but also would not trust the market to make the right decisions when it comes to carbon reductions (see the demonstrated record of markets since 1850). The standard way an economist would approach the problem, assuming that we know what the right amount of carbon abatement is, is to set a cap on emissions and issue tradable rights to pollute (a cap and trade). This would in theory lead to the desired level of emissions reductions at least cost. While preparing for my lecture, I was thinking I should set up a simple model where profit-maximizing producers of fuels face different policy constraints (e.g., subsidies, RFS, LCFS or a cap and trade), a reasonable demand curve and my giant computer. As so often happens to many of us environmental and energy economists, EI@Haas’ all-star team captain Chris Knittel (MIT) and coauthors had already written the paper, which is titled “Unintended Consequences of Transportation Carbon Policies: Land-Use, Emission, and Innovation”. [Skip this paragraph if you are not a fan of wonk]. The paper, which is a great and relatively quick read, simulates the consequences of the 2022 US RFS, current ethanol subsidies and constructs a fictional national LCFS and cap-and-trade (CAT) system, which are calibrated to achieve the same savings as the RFS. The paper assumes profit-maximizing firms which either face no policy, the RFS, subsidies, LCFS or CAT. 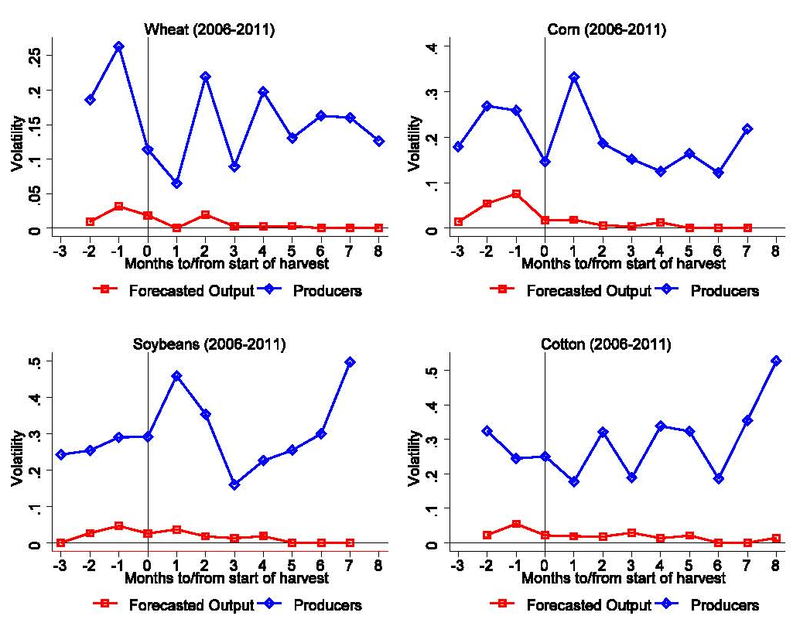 Using an impressive county level dataset on agricultural production and waste, the authors set out to construct supply curves for corn ethanol and six different types of cellulosic ethanol. Chris’ daisy chained Mac Pros then maximize profits of the individual firms by choosing plant location, production technology, and output conditional on fuel price, biomass resources, conversion and transportation costs. Changing fuel prices and re-optimizing gets them county level supply curves. Assuming a perfectly elastic supply of gasoline and a constant elasticity demand curve for transportation fuels, they solve for market equilibria numerically. The CAT leads to the greatest increase in gas prices and largest decrease in fuel consumption. It leads to no additional corn ethanol production and slight increases in second-generation biofuels. The RFS and LCFS both lead to less than half the price increase and fuel reduction compared to the CAT. Both policies see a four to nine fold increase in corn ethanol production relative to no policy and a massive ramp up in second generation biofuels production. All three measures lead to the same reductions in carbon emissions. The subsidies leave fuel costs constant, do not change fuel consumption and lead to a massive increase in first and second generation biofuels, but only achieve two thirds of the carbon reductions compared to the other policies (which is due to the authors using current subsidy rates rather than artificially higher ones which would lead to the same carbon savings). Biofuels lead to lower gas prices and equivalent carbon savings! This is the point, where biofuels cheerleaders scream “everything is awesome!” But this ain’t a Lego movie. Especially since Legos are not made from corn. The paper evaluates the policies along a number of dimensions. First, compare the abatement cost curves for the CAT and the LCFS. When it comes to marginal abatement cost curves, the flatter, the better. What we see in the paper is a radically steeper marginal abatement cost curve from the LCFS compared to the CAT. In equilibrium the marginal abatement cost for the LCFS is almost five times higher that of the CAT. What about those emissions reductions? What happens in practice is that the CAT leads to higher emissions reductions from reduced fuel consumption (by driving less or more efficient cars) and a little bit of fuel switching. For the LCFS there is much more fuel switching and not much less driving. What about land use? Well, since the non CAT policies incentivize ethanol production, significant amounts of crop and marginal lands will be pulled into production. 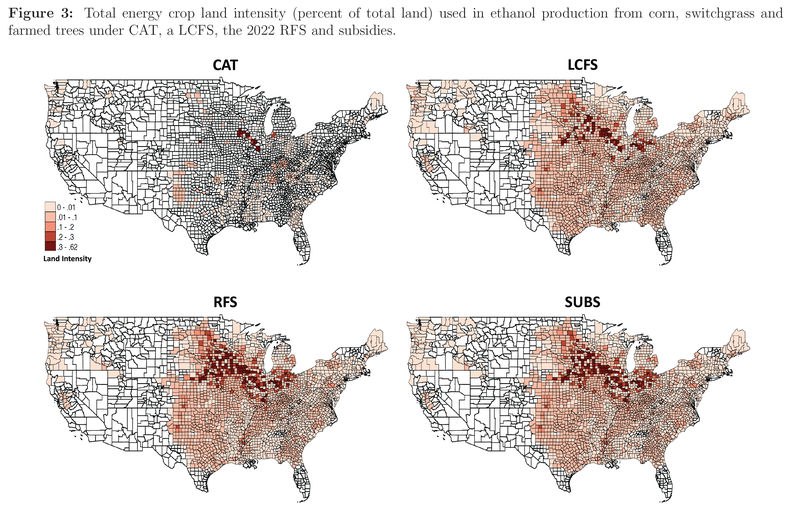 The paper shows that total land use for energy crops goes up about ten fold under the biofuels policies and only by about 30% under the CAT. The paper calculates that damages from erosion and habitat loss from these policies can reach up to 20% of the social cost of carbon compared to essentially 0% for the CAT. Further, ethanol policies create the wrong incentives for innovation, where in some settings the incentives are too strong and in others they are too weak. A further aspect of the paper, which is incredibly clever, is that they show the cost of being wrong in terms of the carbon intensity (e.g., you get the indirect land use effect wrong, which is almost certainly the case) of different fuels can lead to massive amounts of uncontrolled emissions. The carbon damage consequences of being wrong by 10% in terms of the emissions intensity of corn ethanol are an order of magnitude (read 10 times!) the number for the cap and trade. Before I wonk you to death, I will close with some more general thoughts, but staffers of carbon regulators should read this paper. Now. What this work shows is that in the case of biofuels setting a simple universal policy, which lets market participants choose the least cost ways of finding emissions reductions, is vastly preferred to complex renewable fuels or low carbon fuels standards. While I understand that producers of ethanol enjoy their subsidies (much like I enjoy my home interest mortgage deduction), this paper argues that they are a bad deal for society. And so is the RFS, as would be a national LCFS. As we go ahead and design a national carbon policy, I would hope that we take the lessons from this paper and the decades of environmental economics insight it builds upon to heart. This does not say that first or second generation biofuels are a bad idea, but if they want to compete for emissions reductions, they need to be fully cost competitive with other and currently lower cost emissions reductions alternatives. The difference of 44 bu/ac between two years this close apart is bigger than anything experienced in the history of US agriculture. The closest thing was in 1994, when yields were 139 bu/ac after just 101 in the flood year of 1993. When expressed as a percentage swing, to account for the fact that yields overall have been going up, the swing from 2012 to 2014 (36%) is near historic highs but still less than some of the swings seen in the 1980’s and early 1990’s (see figure below). We’ve talked a lot on this blog about what contributes to big swings in production, and why it shouldn’t be surprising to see them increase over time. Partly it’s because really bad years like 2012 become more likely as warming occurs, and partly it’s because farmers are getting even better at producing high yields in good conditions. Sometimes I think of good weather like a hanging curveball – a decent hitter will probably manage a hit, but a really good hitter will probably hit a home run. So the difference between good and bad weather grows as farmers get better at hitting the easy pitches. Moving on from bad analogies, the point of this post is to describe some of the changes we might see as the world comes to grips with more volatile production. What kind of shock absorbers will farmers and markets seek out? Four come to mind, though I can’t be sure which if any will actually turn out to be right. First, and most obvious, is that all forms of grain storage will increase. There are some interesting reports of new ways farmers are doing this on-site with enormous, cheap plastic bags. We have a working paper coming out soon (hopefully) on accounting for these storage responses in projections of price impacts. Second will be new varieties that help reduce the sensitivity to drought. Mark Cooper and his team at Pioneer have some really interesting new papers here and here on their new Aquamax seeds, describing the approach behind them and how they perform across a range of conditions. 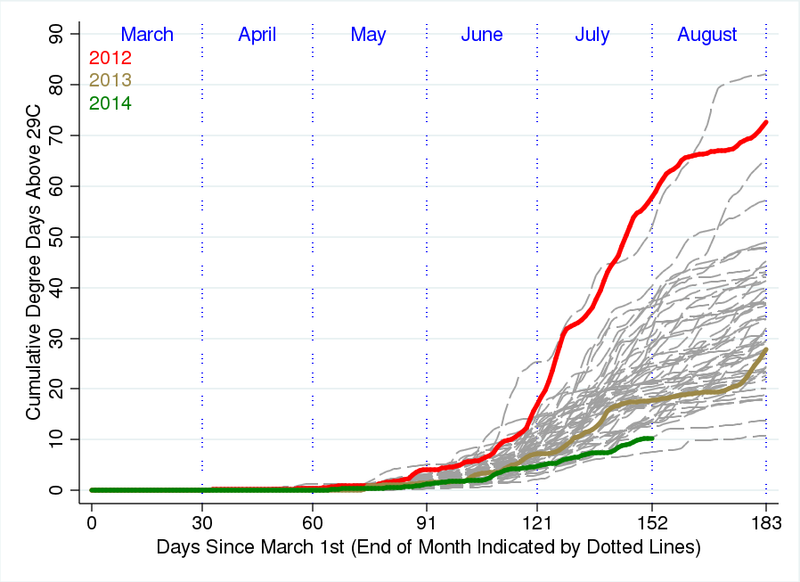 A third response is more irrigation in areas where it hasn’t been very common. 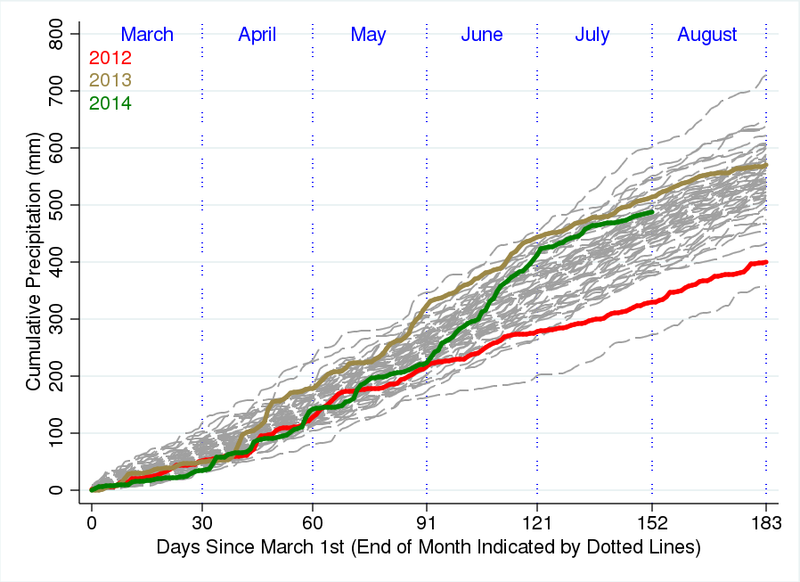 I haven’t seen any great data on recent irrigation for grain crops throughout the Corn Belt, but I’ve heard some anecdotes that suggest it is becoming a fairly widespread insurance strategy to boost yields in dry years. The fourth is a bit more speculative, but I wouldn’t be surprised to see new approaches to reducing soil evaporation, including cheap plastic mulches. There are some interesting new papers here and here testing this in China showing yield gains of 50% or more in dry years. Even in the Midwest, where farmers practice no-till and crops cover the ground fairly quickly, as much as a third of the water in the soil is commonly lost to evaporation rather than via plant uptake. That represents a big opportunity cost, and if the price of grain is high enough, and the cost of mulch is low enough, it’s possible that it will take hold as a way of raising yields in drier years. So between storage and mulching, maybe “plastics” is still the future.